PolarPro is pleased to announce Autel X-Star edition filters to its Cinema Series filter line. 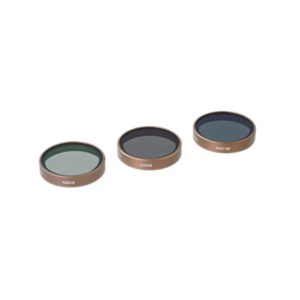 Featuring double-side coatings, Cinema Series glass, these filters have a higher light transmission and lower refractive index than PolarPro’s standard filter line. These filters are designed for professionals who demand the absolute best, at an affordable price. And like the rest of PolarPro’s products, the new Autel X-Star Cinema Series filters are backed with PolarPro’s lifetime guarantee. The Autel X-Star compatible filters are available in two different Cinema Series 3 pack sets. The Shutter Collection features neutral density filters that are designed to maximize shutter speed reduction, providing a smooth cinematic composition. 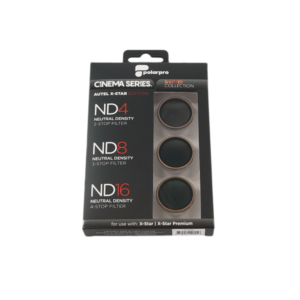 The 2 stop ND4 filter is ideal for reducing shutter speed on partly cloudy days, and during sunrise and sunset. The 3 stop ND8 filter will provide ample shutter speed reduction in mostly sunny conditions, and the 4 stop ND16 filter is great for flying on bright, sunny days, especially near water or snow. The Vivid Collection includes hybrid neutral density and polarizing filters, designed for reducing shutter speed as well as reducing glare and improving color saturation. The polarizing aspect of these filters is especially useful when flying over water or snow, cutting down glare from direct reflections. These hybrid filters will also reduce lens flare. The filters in the Vivid Collection include a 2 stop ND4/PL, 3 stop ND8/PL and 4 stop ND16/PL. For production grade Autel X-Star filters at an affordable price , choose the Cinema Series from PolarPro.